Most airlines now charge for a second checked bag, and even more for a third checked bag. Add-on fees range from $25 to $50 or more per flight, ($50 to over $100 per round trip!!!). 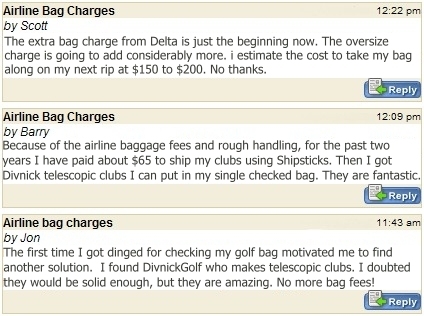 So it can be VERY expensive to travel with a conventional golf bag. You can see a list of all current baggage fees on airlines from around the world here. Our telescopic clubs fit into your first bag, so they essentially FLY FREE! The cost of renting clubs has skyrocketed, and you never know what kind of clubs you will get. So over the course of a few flights, you can more than pay for one or more of our telescopic clubs. This combination of add-on baggage fees and higher rental fees being charged by golf courses has dramatically increased the demand for our telescopic clubs. We don't like the add-on baggage fees, but we certainly welcome the increased business from all over the world. Golfers who want the ultimate portability and convenience are purchasing the Whole-In-One Adjustable Loft Telescopic Club which collapses to 17 inches and easily fits into small roller bags.. Even if they don't get a chance to play golf on their trip, it hasn't cost them any extra to take their club, and they can use it to practice their swing, or hit chip shots out on the lawn. Those who also want longer distance off the tee and fairway, and the feel of a conventional putter are ordering three clubs: The Tee & Fairway Driver, the Telescopic Putter, and the Adjustable Loft Club are the most popular 3-Club Set. They easily fit into larger roller bags, along with golf shoes, clothes, and other items, so you don't have to pay an add-on fee for a golf bag. Click here (or on the accompanying picture) to see a great way to fit multiple telescopic clubs and golf shoes into an airline-checkable travel bag. If you place your order before the end of April , there is a $50 discount for our Adjustable Club, and an additional 10% discount off the entire order if you get 3 or more clubs. The United States Transportation Security Administration (TSA) stopped allowing golf clubs to be carried on flights within and to-or-from the United States flights after the 9-11 attacks. We have been pleading with them ever since to allow clubs on the basis of the fact that no golf club has ever been used in an airline hijacking or attack. Further, they allow canes which are essentially the same size and shape as a golf club. In fact, they also allow walking or hiking sticks. So it is reasonable to allow golf clubs. If the issue is the space in an overhead bin (which is an airline issue, not a TSA issue) we have proposed that they simply restrict it to "telescopic golf clubs that fit into an allowed carry-on bag." And of course, our telescopic clubs would qualify! NOTE: Other countries allow golf clubs to be carried on. As far as we know, only the United States TSA does not allow golf clubs. Obviously, this is subject to change, so if you have different knowledge, please let us know. Even without the freedom to carry our clubs on for now, with baggage fees for a full set of golf clubs at $25 to $50 or more per flight, ($50 to over $100 per round trip!!! 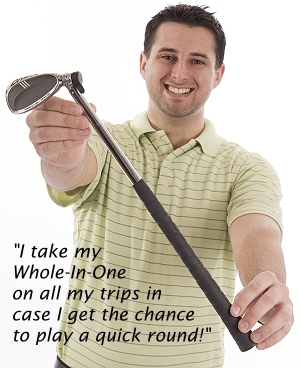 ), it saves a lot of money to take our telescopic clubs in your single checked bag. Hit 'em Long and Straight!